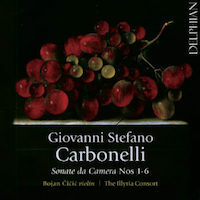 Giovanni Stefano CARBONELLI: Sonate da Camera, Nos. 1-6 (1729). Bojan Čičić (vln), The Illyria Consort: Susanne Heinrich (viol), David Miller (theorbo, archlute, guit), Steven Devine (hpsi). Delphian DCD34194 (1 CD) (http://www.delphianrecords.co.uk/). Pal to Vivaldi, viz. RV 366, Carbonelli went to England and latterly sold claret to the royals. Imagine serious Corelli finely purveyed. YES. Walter BRAUNFELS: Hexensabbat (Witches’ Sabbath), Op. 8 (1906); Konzertstück (Concert Piece), Op. 64 (1946); Hebridentänze (Hebridean Dances), Op. 70 (1950-51). Tatjana Blome (pno), Deutsche Staatsphilharmonie Rheinland-Pfalz, Gregor Bühl (cond.). Capriccio C5345 (1 CD) (http://www.capriccio.at/). Somewhat like Strauss (Till Eulenspiegel pranks Op. 8), here are fleet concertante items for piano and orchestra. Opp. 64 and 70 do blur. NO. 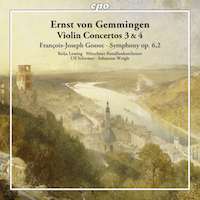 Ernst von GEMMINGEN: Violin Concerto No. 3 in D major (1800)1; Violin Concerto No. 4 in A major (1802)2. François-Joseph GOSSEC: Symphony in D major, Op. 6, No. 2 (1762)3. Kolja Lessing1 (vln), Münchner Rundfunkorchester, Ulf Schirmer1,2, Sebastian Weigle3 (cond.). cpo 777 866-2 (1 CD) (http://www.cpo.de/). Linking Mozart to Beethoven, Lessing has much to do in Gemmingen’s fine concertos, but it is Gossec’s 1762 Symphony which captivates. MAYBE. 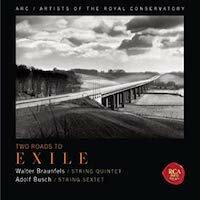 “Two Roads to Exile.” Adolph BUSCH: String Sextet in G major, Op. 40 (1928; rev. 1933)1. Walter BRAUNFELS: String Quintet in F-sharp minor, Op. 63 (1945)2. ARC Ensemble: Marie Bérard1,2, Benjamin Bowman1,2 (vln), Steven Dann1,2, Carolyn Blackwell1 (vla), Bryan Epperson1,2, David Hertherington1,2 (vlc). RCA 88697 64490 2 (1 CD) (http://www.sonymasterworks.com/). Both works take cues from Brahms. Busch regales with counterpoint. 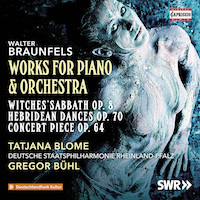 Braunfels offers stiff verismo and an Adagio modeled upon Schubert. MAYBE. Jean SIBELIUS: Impromptus Nos. 5 and 6 from 6 Impromptus, Op. 5 (1890-93); Kyllikki (Three Lyrical Pieces for Piano), Op. 41 (1904); Romance, No. 9, and Barcarola, No. 10, from 10 Pieces, Op. 24 (1895-1903); Der Hirt, No. 4, from 10 Pieces, Op. 58 (1909); Valse Triste, Op. 44, No. 1 (1904; arr. J. SIBELIUS, 1904); Sonatina No. 1, Op. 67 (1912); Björken, No. 4, and Granen, No. 5, from 5 Pieces, Op. 75 (1914); Rondino No. 2 from 2 Rondinos, Op. 68 (1912); Elegiaco, No. 10, from 13 Pieces, Op. 76 (1911-19); Impromptu, No. 5, Humoristischer Marsch, No. 4, and Lied, No. 2, from 6 Bagatelles, Op. 97 (1920); Fünf Skizzen, Op. 114 (1929). 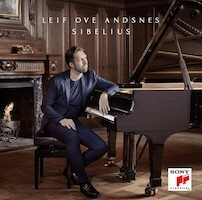 Leif Ove Andsnes (pno). Sony 88985408502 (1 CD) (http://www.sonyclassical.com/). Andsnes enthusiastically performs a slate of Sibelius’ less conspicuous piano pieces, but aren’t these overlooked for a good reason? NO. Hugo WEISGALL: Sonata for Piano (1982). Paul HINDEMITH: Ludus Tonalis (1942). Martin Perry (pno). Bridge 9487 (1 CD) (http://www.bridgerecords.com/). 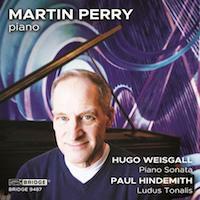 Astonishingly, Perry provides a listenable, engaging Ludus Tonalis. Weisgall’s Sonata is a surprise: cranky, serial, boldly passionate. YES.